HumiSeal, the leading conformal coatings solutions provider for the protection of printed circuit boards and electronic assemblies, has announced the launch of a new website dedicated to making it easier for engineers to identify the correct product for their applications. 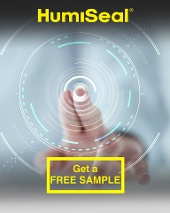 The new website www.humiseal.com represents an industry first by featuring a live and interactive selection guide as well as everything you need to know about conformal coating. 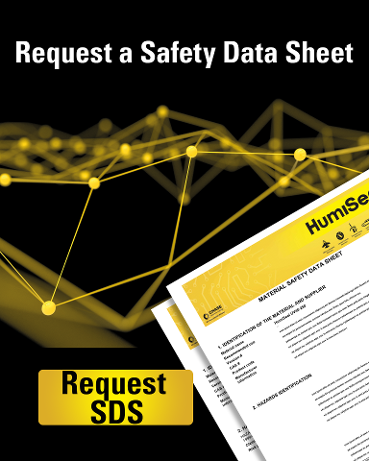 The launch of this site, combined with recent publication of the company’s Facts and Data handbook, re-affirms HumiSeal’s leading position in this sector. As well as all the usual technical information, company background and downloads, visitors to the site looking to correctly match coating properties to their application’s requirements will also be able to use a fully interactive product selector. Users are able to enter environmental parameter requirements, in terms of operating temperatures, chemical resistance, cure time, VOC and approval requirements etc. Graphical icons represent the various chemistries and according to the values entered by the user, the product selector recommends the coating type that best matches the application. The use of graphical user interfaces are designed to make www.humiseal.com extremely easy to use for anyone that may be unfamiliar with conformal coating. Currently available in English or French, additional languages will be added in the future. HumiSeal believes that the need for a new website offering these levels of functionality has never been so great. The global shortage of electronics engineers is drawing a steady stream of newcomers into the field. In addition, the reliability-enhancing nature of conformal coatings has established itself as a highly effective way to combat the vast cost, not to mention reputation-damaging effects, of having to rectify field failures. As such, the company has witnessed the use of conformal coatings becoming increasingly popular in many less traditional consumer and domestic applications - especially densely packaged portable electronics devices that can be susceptible to environmentally induced failures in the field. Nonetheless, choosing the right coating material and application process can be very difficult and time-consuming for the uninitiated. Without a sound overview of the subject and familiarity with the relevant standards and specifications, expensive and irreversible errors can easily be made. Phil Kinner, business manager for HumiSeal, summed up the new website by saying: “Today HumiSeal is renowned for its technical leadership, energy and vision and this new website continues this theme. This website represents a significant breakthrough in regard to coating specification. The design and navigation makes this website very easy to use for both existing and new customers alike. We feel that the HumiSeal product range sets the benchmark in terms of technical performance and after sale service and it is fitting that this is demonstrated through this unique website. I am delighted with humiseal.com and initial feedback has been extremely positive”. For more information on HumiSeal and its product line please visit www.humiseal.com or contact you local distributor. This entry was posted in News on October 31, 2008 by FingerLakes1.com, Inc.